When we study a foreign language, we should always have a way of organizing and memorizing the important points along the way – a system of “mental landmarks”. We need to know that we have mastered the material and are moving forward, and we need to make sure that what we’ve learned in the past isn’t disappearing into thin air. For each grammatical or lexical topic, it is important to establish some kind of reference point in order to mentally organize the material. This can be done on paper or online, for example with the help of diagrams like mind maps. Use of such devices is crucial for studying Russian because Russian grammar is not exactly a walk in the park; it is full of exceptions and contradictions, and contains a great deal of subtle detail that, if not mastered, makes it impossible to properly use many of the lexical/grammatical elements of the language, and thus impossible to properly write, speak, understand text or speech and so on. 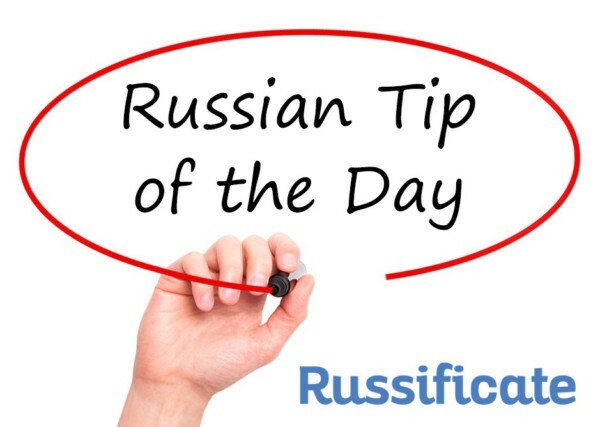 In order to help you organize these reference points and “mental landmarks” without getting lost in the details, the team of Russian language school “Russificate” created “Russian Tip of the Day“, to which you can subscribe free of charge. You can also choose to receive “Russian Tip of the Day” updates via social networks. The members of the “Russificate” team are experienced teachers of Russian as a foreign language. Every day you will receive tips and advice in your email to aid in the study of different areas of Russian language, complete with examples of usage of various lexical or grammatical constructions. For example, which case to use when expressing emotions and physical states, what collective numerals are and how to use them, exceptions for declension of adjectives, and so on. For students who haven’t studied these topics yet, it provides an introduction to the material to be kept in mind for future study, and for those who have, it serves as an opportunity to review the important points of Russian grammar. We wish you success in your study of Russian language! A journey of a thousand miles begins with a single step! Don’t have RussianPod101 subscription yet? This is the best time to get it!